Hastings' debut album is released on Biff Johnson's Broad Vista label, although Hastings' style is quite a bit different than the tribal ambient style of Johnson's two albums. It features 19 (!) tracks all between two and six minutes long, featuring a sound that is mostly an original blend of sequenced rhythms, spacey chords, and lots of effects. 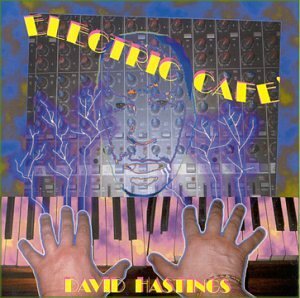 Hastings has a lot of different influences, and I hear artists like Frank Zappa (Synclavier music particularly), Jean-Michel Jarre (on "Revenge of the Delinquent Account"), and Klaus Schulze in his music. Hastings' strengths lie in both the concise focus of each one of his tracks and the detail therein. The music sort of comes out like a wall of sound, whether the piece is an electronic floater, a more classical, piano-based song, or a sequencer surge. There are lots of synthesized sounds pinging around the ambiance, making for a real shimmering, busy sound. It's quite the nice debut and very different.